What's better than milk and cookies ice cream? 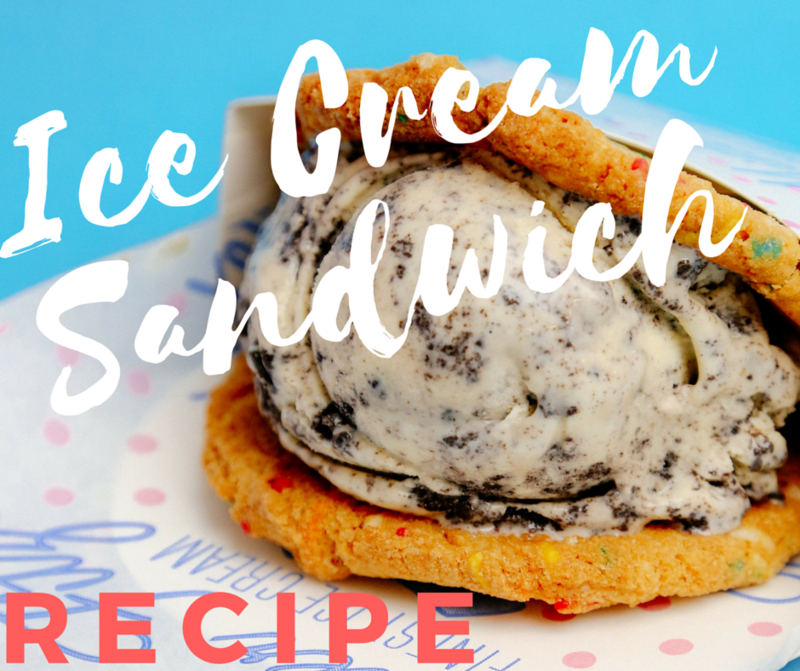 Milk and cookies ice cream sandwiched between two confetti cookies, that's what. 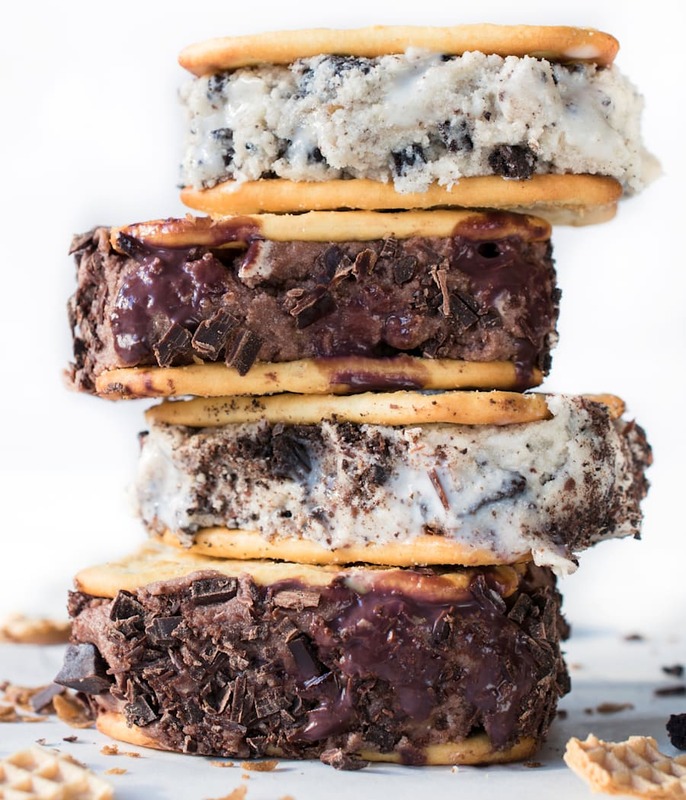 This ice cream sandwich is a mix of sweet, soft cookies and creamy, cookie-filled ice cream. Basically, it's the perfect way to combine two of your favourite dessert foods and eat in the one go. If you're wondering how to make such a mouthwatering treat at home, this easy recipe by Mister Fitz has you covered. It does require an ice cream maker, but if you/your family/friends/neighbours don't have one, don't worry -- just buy a good-quality vanilla ice cream and stir in the crushed cookies. Massive warning: resist the urge to eat all the ice cream and cookies before assembling them. Play around with your favourite toppings and flavours. 1. Put ice cream bowl for churning in the freezer (day before) if required for your ice cream machine. 2. Place milk, cream and vanilla bean into heavy bottom pot, bring to the boil and set aside to infuse. 3. Strain vanilla milk and allow to cool. 4. Place a pot of water on stove to make a double boiler. Place large stainless steel or heat proof bowl over simmering water. Whisk yolks and sugar over the double boiler until light, fluffy and tripled in size. 5. Pour vanilla infused milk over egg yolk mix and stir. Place in the fridge until cold -- overnight is best. 6. Pour ice cream mix into churning bowl and proceed as per ice cream machine instructions. 7. Once churned, fold through crushed up biscuits, pour mix into freezer proof container and freeze until set. The higher the stack, the better. 1. Melt butter in a pot until just melted. Set aside to cool. 2. Once cooled, add to mixer with the sugars and mix until well combined. 3. Add egg and yolk, and mix until smooth. Gradually add flour until combined and no lumps. Mix in sprinkles. 4. Weigh into 50g balls and press onto a tray, spacing 3cm between each cookie. 5. Bake at 160°C for five minutes. Turn tray around and put back in the oven and cook for a further six minutes. 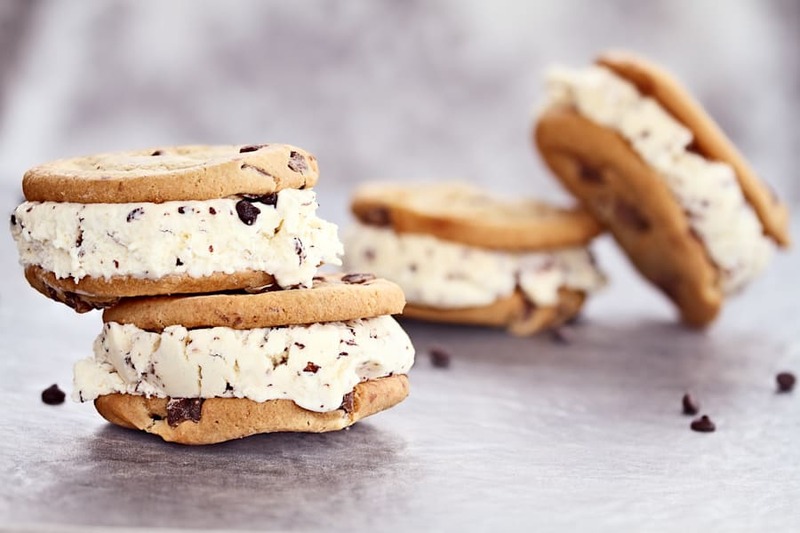 For each ice cream sandwich, place a scoop of ice cream between two cookies and gently squeeze together. 1. Take it a step further and add toppings like gummy bears, pretzels, crushed Oreos, nuts or candied bacon. 2. The cookie dough does not require refrigeration before cooking, but if you wish to make the cookies prior and refrigerate, that is fine. 3. We cook the cookies just before serving so we recommend cooking them and allowing 10 minutes to cool on a rack before using. Fresh cookies are always best. Recipe and images by Mister Fitz Finest Ice Cream.